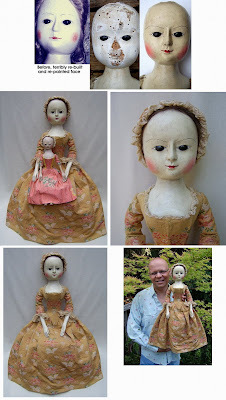 With reference to my recent post in my other blog, Morgaine Le Fay Antique Textiles, here are some more glorious photos of the work of David Chapman & Paul Robinson of 'The Old Pretender' wooden doll workshop. 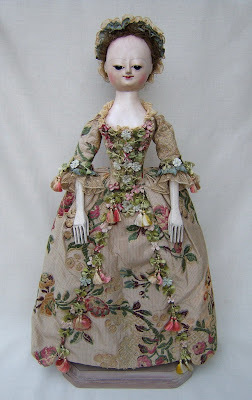 As well as making the most beautiful reproduction dolls dressed in authentic fabrics and trims from the period, these young men also restore authentic 17th & 18th century dolls. 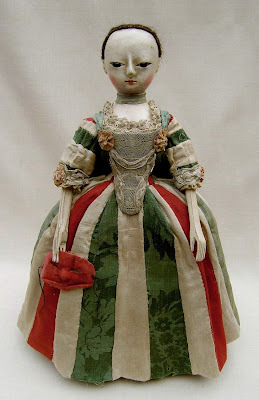 They are currently working on one of the rarest English dolls in the world, one of only 22 known examples made in Whitechapel at around 1680 by William Higgs. 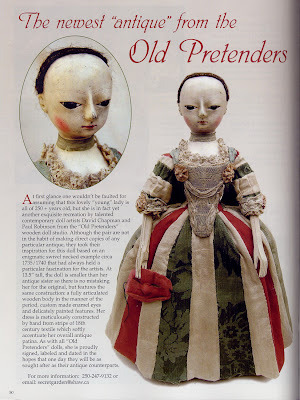 The first photos detail some examples of their restoration work, then a magazine article about their reproduction dolls, followed by some examples of their reproduction dolls. I will let the photos speak for themselves rather than wittering on too much, please click on each picture to really appeciate the detail here! What amazing dolls! I loved looking at the close-up view and the incredible detailing of the dress/costumes. 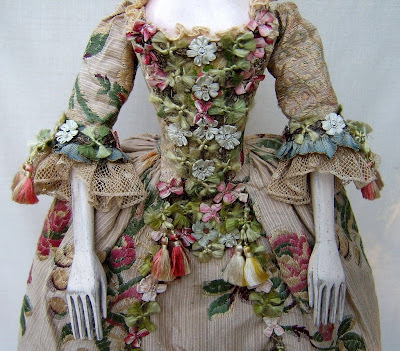 The textiles and trims are exquisite. Thanks for sharing such a fascinating subject. 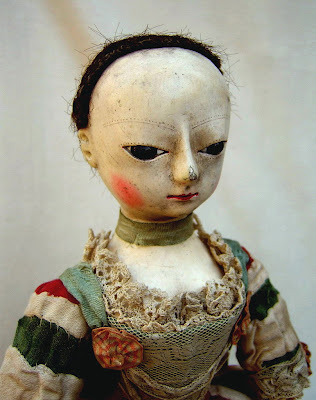 I cannot tire of looking at these dolls, they have such character in their faces... If they could speak, what tales would we hear?? Lois you again have found another seam of pure gold, I always enjoy visiting your blog for the wonderful things you find. I'm in love. Thanks so much for the fabulous photos of these beauties.